In 2010 the Museum of the City of New York published online versions of more than 50,000 historic photos of New York City. Among the thousands of Bronx images was a haunting 1905 photograph entitled Slave Burying Ground. The only other information available about the photo was that it was taken at "Hunts Point Road" -- a street that no longer exists. Local history teachers wanted to know more. From primary history documents like wills, newspaper accounts and old maps, it turns out the cemetery was "across the road" from Drake Park- the Hunt, Leggett and Willett family burial plots that date back to colonial times. It's most famous grave honors well-known 19th century poet Joseph Rodman Drake, but the adjacent Slave Burying Ground has disappeared without a trace. Since 1909, the NYC Parks Department has administered Drake Park. As time went by the cemetery grew more run-down every year, and finally, the youngsters of nearby PS 48, the Joseph Rodman Drake School, helped raise money to restore and protect the historic site. On April 12, 1962, city officials and the entire PS 48 community held a dedication ceremony at the cemetery and the students placed a commemorative granite plaque in the SE corner. How many people were buried there and who were they? We don't know, but are learning more all the time. According to the 1800 Census, Abraham Leggett alone owned ten enslaved Africans. 1. John Leggett married a Hunt and both husband and wife are buried in Drake Park. He orders the (nameless and numberless) remainder of his slaves to be sold at auction. 2. Another source reveals that the last person buried in the Hunts Point Slave Burying Ground was "an old negress" named Aunt Rose -- nanny at one of the Leggett mansions. Aunt Rose was interred there in the 1840s, more than a decade after slavery was abolished in NY State in 1827. 3. Several accounts say the slave cemetery was the final resting place of Bill Swan, a Hunt family slave and famous East River pilot who during the Revolutionary War was aboard the British warship HMS Hussar that sank near Hellgate with the loss of dozens of American prisoners and payroll chests of gold sovereigns. 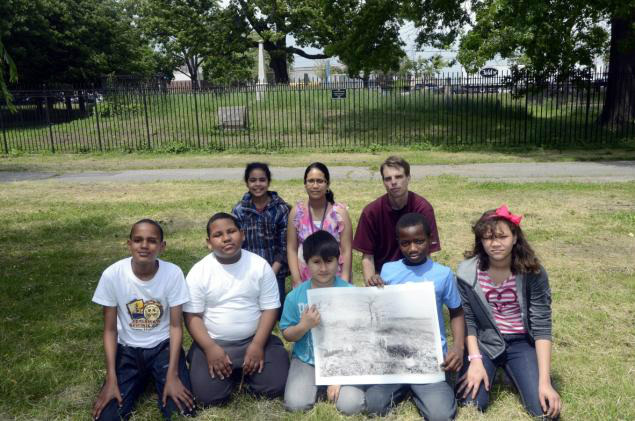 What can the Hunts Point Slave Burying Ground Commemoration Project do?  write the stories of forgotten men, women and children back into our community history. Interested in citations related to the documents collected for the HPSBG Project? Find selected sources here. View a version of the HPSBG Presentation. Available for download as PDF and Powerpoint below. The Hunts Point Slave Burial Ground Project has been included in the Memory and Landmarks: Reports of the Burial Database Project of Enslaved Americans. The burial database has been developed through the efforts of the Periwinkle Initiative, which is "a public humanities and education initiative dedicated to preserving cultural heritage associated with enslaved Americans. The Initiative’s core project is the National Burial Database of Enslaved Americans – which will be the first and only national repository to document individual burials and burial grounds of enslaved Americans." The work of the HPSBG has been recognized in the Periwinkle Initiative's Spotlight on Local Work.